From high-end hair care to bespoke Trichologist sessions, Philip Kingsley deliver a holistic approach, including lifestyle and nutritional advice, to help clients achieve their best head of hair. Supporting their journey to healthy, beautiful hair. Philip Kingsley’s Trichological Clinics and product laboratories are home to the world’s most renowned hair and scalp specialists and work closely with doctors, surgeons and dermatologists. Their team of Trichologists have expertise in treating all types of hair loss and scalp concerns, ranging from alopecia, dandruff, seborrheic eczema and psoriasis to name a few. Philip Kingsley offer bespoke products and services that treat cosmetic issues such as hair breakage, dryness, dullness, lack of body and unmanageability. From their Mayfair and New York Clinics, the home of world-leading Trichologists, Philip Kingsley products, consultations and services deliver life changing hair. Theradome™ is a medical therapy company located in Silicon Valley focused on developing the world’s most technologically advanced Laser Phototherapy (LPT) devices. Our company is committed to restoring health and confidence in people all around the globe by bringing affordable, clinical strength hair rejuvenation therapies into the home. We are revolutionizing the hair restoration market by raising its standards of performance and innovation while partnering with top leaders in the industry. We rely on the scientific laws that govern Laser Phototherapy and optimum scalp health restoration to offer our customers superior products that are clinically proven to be safe, effective, and for a fraction of the cost. Our at home, innovative hair growth products combine power, convenience, and affordability with a simple brilliance that is unique to Theradome. Hamilton Fraser provides specialist insurance and ancillary services to the private rented property sector and the cosmetic and aesthetic practitioner industry. We believe in providing expert customer support and our focus is on providing comprehensive products for our customers at competitive prices. We draw on 20 years of experience to provide industry leading, cosmetic insurance services, with our Hamilton Fraser Cosmetic Insurance brand. We were the first ever commercial insurance provider to offer medical indemnity insurance specific to the aesthetic industry in 1996. Today we continue to support the industry by working with leading organisations within the cosmetic sector and pride ourselves in playing an important role in raising standards across the industry. The Paxman Scalp Cooling System is globally recognised as the leading product for hair loss prevention during chemotherapy treatment. Paxman has been pioneering scalp cooling technology for over a quarter of a century. Having carried out extensive trials and product development, we have created a system that is clinically proven, cost-effective and widely embraced by doctors, nurses and patients alike. Lamberts® has been supplying nutritional and herbal supplements to health professionals for over 30 years. We are the leading experts in nutrition and herbs, producing the highest quality products in some of the most modern and technically advanced factories in Europe. These operate to stringent pharmaceutical standards of Good Manufacturing Practice (GMP) as laid down by the UK Department of Health, Medicines and Healthcare Products Regulatory Agency (MHRA). Lamberts® philosophy of healthcare is all about ‘sound’ science – we only develop products that are at the relevant potency, based on an in-depth understanding of the latest nutritional research. And we have a range of over 150 products including vitamins, minerals, amino acids, digestive aids, essential fatty acids and herbs, as well as specialist formulas such as Florisene®. 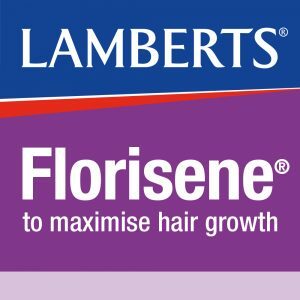 Lamberts® Florisene® is a clinically proven supplementation programme shown to help women with Chronic Telogen Effluvium (CTE), the term used to describe excessive and persistent hair shedding. CTE affects an incredible 4.8 million women in the UK and Florisene® has been a great success with thousands of women already using the product. Tangle Teezer is a global haircare brand designed and manufactured in Great Britain. Launching with The Original in 2007, Tangle Teezer has reinvented the hairbrush category and changed the way people treat their hair. Initially rejected from Dragons’ Den, it has since been classed as the one that got away and hailed as one of the most successful ideas to be featured on the programme. Having now sold over 50 million hairbrushes, Tangle Teezer is now sold in over 70 countries worldwide and sells 20 hairbrushes every minute globally. Having helped people effectively detangle their hair for over ten years, it was recognised that thinning hair in women was a global problem. To help tackle this, the brand recently launched a new detangling hairbrush specifically for Fine & Fragile hair in partnership with The International Trichology Congress.